I immediately wiped out Windows 7 and (other) junkware that they had put on my laptop eating up a huge chunk of my precious SSD space, and installed Ubuntu Oneiric Ocelot. Due to this rare opportunity of having a fresh install of Ubuntu I decided to do some tests to see how well this laptop's hardware is supported in this OS both out of the box and with additional drivers. So I ran the complete set of tests from the System Testing utility. The full report is available here. As you can see from the test results most laptop's hardware is supported out of the box. It includes graphics that works both with open source and proprietary drivers, networking, camera, card reader, etc. So I will only focus on the few things that are not working and how to fix them. Note that although optical drive test fails the drive itself works perfectly. However the default disk burning software (Brasero) has some problems with it, like being unable to eject disks. So I recommend using K3b instead. It enables the control of laptop backlight connected to NVIDIA chip using the /sys/class/backlight interface. 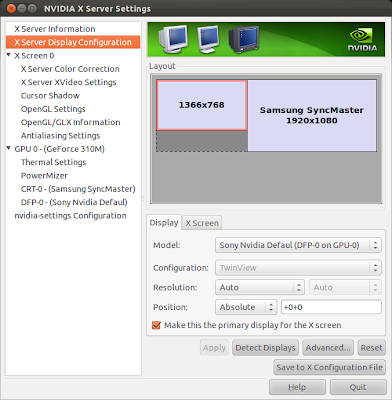 Open NVIDIA X Server Settings. Go to "X Server Display Configuration". 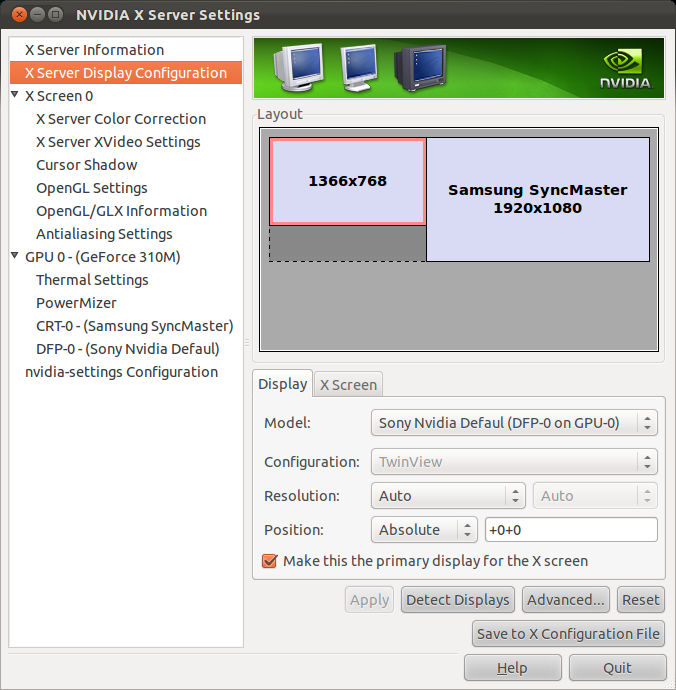 Select the external display and choose TwinView in "Configuration". Click "Save to X Configuration File" if you want to make this configuration permanent. Option "metamodes" "DFP: nvidia-auto-select +0+0, CRT: nvidia-auto-select +1366+0"